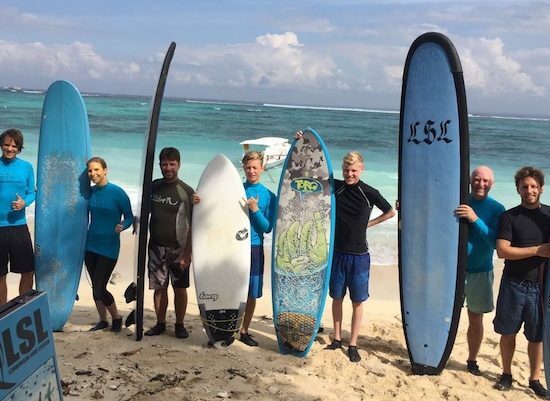 Nusa Lembongan is the ideal place to learn to surf or get a few lessons to re-ignite your surfing confidence. Find out more on the links below. Nusa Lembongan is home to some world-class waves and has surf-able waves all year round. The island has three main breaks that can be enjoyed by the beginner to the more experienced surfer. All breaks are dependent on tides with best conditions on mid to high tides. Playgrounds is an easy surf spot to get to. A short paddle from Coconuts Beach, it is a sheltered reef break providing reliable and enjoyable surf conditions. It has a fun, long left and (depending on the tide) a shorter barrelling right-hander. On a smaller swell Playgrounds is an ideal spot for beginners and often referred to as a “party wave”. Located just to the right of Playgrounds, this right hander is great learner wave, ideal for beginners on a small to medium swell. A short paddle from Playgrounds or a quick boat ride from shore. Lacerations is best at mid tide. A right hand break for the more experienced surfer. The main take off point is a peak that jacks up in one section with great tubing sections and fast walls to race through. There is also another take-off point further in that is a fun walling wave with also plenty of power. Be aware, on 2m+ swell this spot can produce some sneaky bomb sets. A boat ride is required to get to Shipwrecks and is best on mid to high and high going to low. Located on Ceningan Island, when there is no swell at Nusa Lembongan take a 15 minute boat ride to this point break for a fun 2-4 foot lefthander. Best on a mid-tide, this wave has some testing sections to make. Tends to close out on larger swells, but a great option when there are no waves at Nusa Lembongan.